We’d love your help. 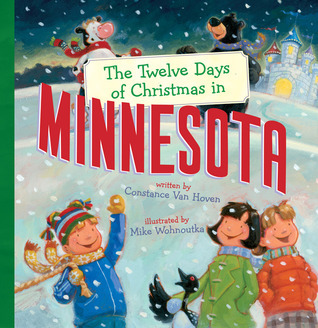 Let us know what’s wrong with this preview of The Twelve Days of Christmas in Minnesota by Constance Van Hoven. To ask other readers questions about The Twelve Days of Christmas in Minnesota, please sign up. You get a lot of bang for your buck here! The Minnesota twist to the lyrics plus background information on the state. This book sounds like the book is a silly parody. After all, what do you think of when you think of Minnesota? Well, perhaps snow. What else? The mind of this Texan draws a blank. Using a twelve days of Christmas format, the author reveals there is much more to Minnesota than just snow. Like Norway pines. And hockey sticks. And lumberjacks. And walleyes. Lots more. Just so you know. The pictures are bright and colorful. The text is written in the format of letters, making it very kid-friendly. I c This book sounds like the book is a silly parody. After all, what do you think of when you think of Minnesota? Well, perhaps snow. What else? The mind of this Texan draws a blank. I can see that this is a book I’d love. If I lived in Minnesota. 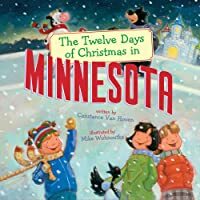 So while this book was great and adorable, as a Minnesotan I could not get past the fact that over 12 days Jack, Sarah, Hannah, and Aunt Christine managed to travel from the Twin Cities to Brainerd to Pipestone and all over the state of Minnesota...in the middle of winter. That much time on the road is trying even in the summer, but in the middle of winter, no Minnesotan in their right mind would do that. I get it's a kid's book and they want to see the whole state...but c'mon. I still did like So while this book was great and adorable, as a Minnesotan I could not get past the fact that over 12 days Jack, Sarah, Hannah, and Aunt Christine managed to travel from the Twin Cities to Brainerd to Pipestone and all over the state of Minnesota...in the middle of winter. That much time on the road is trying even in the summer, but in the middle of winter, no Minnesotan in their right mind would do that. I get it's a kid's book and they want to see the whole state...but c'mon. We met illustrator Mike Wohnoutka at the MN State Fair - lovely person and wonderful illustrator. This book was perfect for our family Christmas book library - we get one new book each year, and only bring out the special "library" at Christmastime. I love that Mee Moua is included in the list of famous Minnesotans in the back of the book. Middle of the road review-wise, we purchased as a keepsake Holiday title. Adorable and fun, but mostly for the keepsake value. Each day is experienced in a different part of the state and features information regarding that area. Fun, informative, and shows off some great winter and general highlights of the state! Great way for anyone to learn about Minnesota! Great book that brings in Minnesota! Gives great history on the state. Love all the facts about Minnesota!